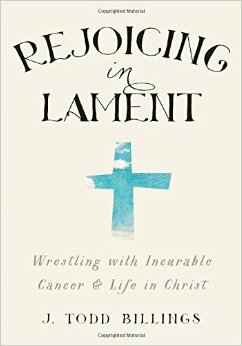 That’s what Todd Billings has given us in his recent offering Rejoicing in Lament: Wrestling with Incurable Cancer and Life in Christ. At the age of 39, Billings was happily married, father of two young children, and beginning a promising career as young Reformed theologian turning heads with rich, careful theological scholarship (Calvin, Participation, and the Gift, The Word of God for the People of God, Union with Christ). Then he was diagnosed with advanced, incurable blood cancer, and the bottom dropped out. The future that once looked so clear–marriage, watching his children graduate, scholarship–immediately fogged over with the pronouncement that he could no longer look forward to the “median” life-span that that most of us blithely assume we’re owed (p.7). In the midst of his own struggles with pain, suffering, and the agony of uncertainty, Billings has produced a profound meditation on the hope of the Christian life in light of the realities of the gospel. Rejoicing in Lament is rather unique in that it occupies a middle range in terms of its approach and appeal. It is not a strictly academic work, and yet Billings is a top-shelf theologian, so it’s not just a pop-book either. It is top-shelf theology that has been lived in and communicated with an eye toward the sufferer in the pew, with Billings interspersing the story of his cancer battle–diagnosis, treatment, future prospects–within the broader story of God’s saving action in Christ. I hope you’ll read the rest of my review at Reformation21. This is an important and helpful book. Derek, do you think this is a book someone who is not familiar with ‘reformed’ teachings who is struggling with suffering in their family would understand and therefore benefit from? I definitely think this is not just for someone familiar with Reformed teachings. I think all can benefit from it. I hope this book helps many who have gotten a bum steer from the church on just what the Christian life is supposed to look like.